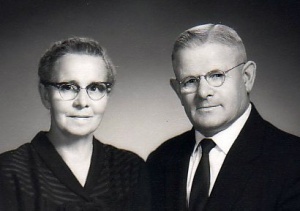 Nickolai “N.N.” Friesen: pastor and evangelist; born 15 April 1901 in Kamenetz, New Samara, Russia to Nickolai Johann and Margaretha (Dyck) Friesen. He was the fourth child of six from this union, four daughters and two sons. His mother died when he was four years old. His father married Katherina Stobbe, and they had five daughters and three sons. Nickolai died 28 September 1995 in Abbotsford, BC. N. N. Friesen married Elizabeth Duerksen (1 November 1901–6 December 1969) on 11 March 1924 in Ischalka, New Samara. In 1925 they moved to Canada with their eight-month-old son. N. N. was the only one in his family to emigrate, having left 10 family members in the Soviet Union. They settled with Elizabeth’s parents at Mayfair, Saskatchewan. Four daughters and two more sons were born to Nickolai and Elizabeth in Canada. In Russia, Friesen completed 3 years of high school in 2 years, received his teaching certificate and became a teacher. In Canada, he built a log cabin for his family, cut firewood to sell, and picked up stones in farmers’ fields to support his family. Eventually he farmed, raised livestock, taught the Russian language to Dukhobors, and delivered mail. On 12 August 1928, he became a lay minister at Mayfair Mennonite Church and was ordained 23 June 1929 by Bishop Johannes Regier at Rabbit Lake, Saskatchewan. In 1939, Friesen was called to pastor the Mennonite Church at Black Creek, Vancouver Island, BC, where he also established a Bible school. He served without pay, farming and driving school bus to support his family. In response to a request from the Conference of Mennonites mission board, he became an itinerant evangelist in British Columbia. He traveled up to nine months each year, seeing many conversions. In his prime he knew every minister and deacon in the Canadian conference. On 31 May 1953 he was ordained as a bishop. That year the Bethel Mennonite Church in Aldergrove called him as lead pastor. He served until 1979, when his church celebrated his 50 years in the ministry. N. N. Friesen served as chairman of Canadian Mennonite Pastors, chair of the Conference of Deacons, chair of the British Columbia Mennonite Conference in the late 1950s and early 1960s, and was a member of the Missions Committee of the General Conference Mennonite Church. He was called to teach in Mexico for three months in the summer of 1969 and later returned to conduct evangelistic meetings. For 12 years he sent his sermons to Russia, Mexico and throughout Canada, 225 copies each month. In his memoir Friesen writes, “At the end of every day when I say my evening prayer, I try to make it all-inclusive: that the eye of God may watch over the sick, the tired the weeping; those who are still in darkness, and those who are seeking rest for their souls.” These were the concerns that motivated this humble yet effective minister. He saw the bigger picture. Friesen, N. N. Recollections From My Childhood and Life. Clearbrook, BC. Self Published, 1977-1980. Friesen, N. N. More Recollections From My Life and Ministry. Clearbrook, BC. Self Published. 1987-1988. Friesen, Jane Herstine. “Happy Birthday.” The Mennonite (9 April 1991): 151-153. Friesen, Jane. "Friesen, Nickolai N. (1901-1995)." Global Anabaptist Mennonite Encyclopedia Online. October 2004. Web. 22 Apr 2019. http://gameo.org/index.php?title=Friesen,_Nickolai_N._(1901-1995)&oldid=143356. Friesen, Jane. (October 2004). Friesen, Nickolai N. (1901-1995). Global Anabaptist Mennonite Encyclopedia Online. Retrieved 22 April 2019, from http://gameo.org/index.php?title=Friesen,_Nickolai_N._(1901-1995)&oldid=143356.